This is part of the continuing collaboration between two great British companies Funktion One and Formula sound who both have stunning pedigrees to live up to. Formula sound have made some of the most iconic mixers a DJ booth has ever seen and Funktion One make in my opinion the best professional sound systems in the world. 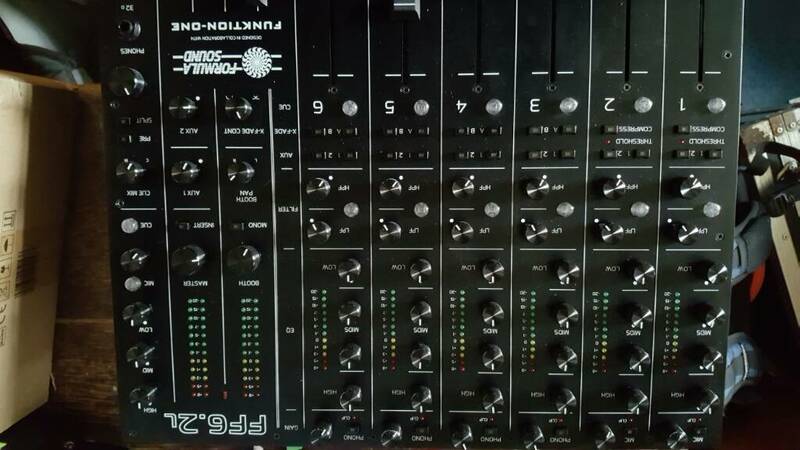 Taking it out of the familiar Formula Sound box the first thing you notice is the weight, for a DJ mixer its encouragingly heavy it feels solid and the range of controls makes it look on first glance very like the popular FF6000 in black. Setting it up is pretty straight forward , swapped out the FF4000 from Glasgow Universities Hive nightclub which is conveniently kitted out with a Funktion on Res4/F221 system witch is capable of shaking the whole west end . The mixer is routed through a Formula sound limiter AVC2D to keep the system from destroying the new union building and to prevent to much movement on the snooker tables 4 floors above. The x-over is a Funktion one XO4 and the amps are Funktion one E series including an E90 9000W @ 4ohms monster for the 4 x 21" drivers on the bottom end. After plugging in and chasing off some random medical students that may have been drinking i stuck on a CD copy of the new chic remix releases to warm the system up.. I plugged in my HD25s and put them on to be stunned with what sounded like a completely different set of headphones, (i,ve owned these for at least 12 years and done thousands of gigs with them) the sound was stunning through the cans, the detail and openness was quite disconcerting, not like any other mixer I've used ever, this was a pretty good start to the evening. Once everything was as i like it and i had put my mixing trousers on i got some newish house tunes out, toward the funkier side with decent production and wound the system up a bit, first obvious thing you notice is there are four eq pots per channel giving substantially more frequency cutting control around the sub end of the spectrum, you can keep the energy on the floor while reducing the wash of sub that can spoil the mix . With the eq's flat the sound is big, really really big there is so much space in the music which i have to add made the first few mixes terrifying because you can hear everything, you need to be accurate and thoughtful. Once you get your head around the quality of the output it really starts to get exciting, stuff happens in mixes that you have never heard before which encourages experimentation, i had genuine excitement while using this, i cant remember feeling that since the first residencies that i had the chance to play 4 nights a week which gave you the chance to really experiment with how certain tunes mix together. The addition of HPF/LPF on the line channels gives you a bit of variation in executing mixes and if you feel the need there is ample provision to insert effects processors, preferably high end low noise to minimise distortion on the channels. The Mic channels have compressors on them which is an intelligent addition to the desk especially if you have a guest vocalist as the Formula Sound mic channels are better than most house desks, and if you are working a big room the compressor makes a big difference, also handy if you are recording the set. DJ Interface, the creative tools. Simple informative graphics, anodised black front panel, large knurled aluminium knobs, spring loaded LED buttons, intuitively mapped and spacious layout make for a beautiful aesthetic and natural workflow. Precise four-band full-kill EQ not only allows for complete frequency band cuts and isolation, but also for subtle spectral balance mixing more common in studios. The EQ frequency response characteristics have been carefully optimised to give excellent and intuitive control of bass, low-mid, high-mid and highs. Separate high pass and low pass filters on each channel encourage more creative mixing possibilities. These specifically developed adjustable filters cut frequencies with accuracy and transparency and can be easily bypassed when not in use. Channels 1 and 2 are switchable between microphone or stereo line inputs. These channels also both have a selectable compressor built in for further control. Channels 3 to 6 are switchable between stereo phono or line inputs. These channels have separate cross-fader routing selection. The contour of the cross-fader is adjustable to preference. A dedicated console microphone input is also provided. With three-band EQ, level, on-off and cue selection, it is routed directly to the master output. Two separately selectable auxiliary sends, on each of the six channels, can be used to route audio to external effects. Individual level controls for both auxiliary sends are located in the output section of the mixer. The effects return via any other channel, allowing for full control in terms of level, EQ, filters and compression. An additional insert is provided at the master output stage. Extensive metering is provided to encourage correct gain structure in order to maintain the highest audio quality. All Input channels have 12 LED metering with an additional clip warning LED. Master and booth outputs have 2 x 12 LEDs for stereo metering. Booth output has optional mono selection and pan adjustment to accommodate any booth set-up or preference. The high power cue headphone output is through both 3.5mm mini-jack & 1/4in jack sockets. The precise cue/master mix, split cue and pre EQ/filter selection provides complete listening control. All controls have been selected for the quality of feel and reliability. Faders are well weighted and precise. These features have been carefully chosen & developed to be creative tools to help the artist elevate their performance, and showcase their music in the best possible way. Connectivity and control for the sound engineer. The ergonomic and intuitive layout continues on the back panel. Each input and output connector is aligned with the corresponding front panel controls for ease of patching. Channels 1 & 2 both have twin balanced 1/4in jack sockets for line and single balanced XLR sockets for microphone inputs. The balanced line inputs allows external instruments and other DJ mixers to be routed through the FF6.2. Channels 3, 4, 5 & 6 all have two sets of stereo RCA connectors. The lower pair are for phono inputs and the upper pair are for line inputs. Both have recessed gain trim. The phono pre-amps are of very high quality. Further controls are located on the underside of the mixer for system technician use. These include: Microphone level trims; phantom power switching; optional microphone to DJ booth routing and threshold & ratio for both built-in compressors. The console microphone input is a single balanced XLR socket, with the corresponding gain trim and phantom power switch next to the connector. The stereo master and booth outputs are via twin balanced XLR sockets. A separate single XLR socket is also provided which can be switched (via the underside of the mixer) between a mono master output or a sub-bass (<80hz) output. The stereo direct insert is via twin 1/4in jacks (both 3 pole send and return). The two stereo auxiliary send outputs are via twin balanced 1/4in jacks. Record out is via stereo RCA. All fore mentioned connectors are gold plated. An additional stereo 'zone' output is provided via a 9 pinPhoenixconnector. This output is controlled by a dedicated remote panel which can be physically located within the zone (for example in a bar or green room). A fire alarm interface via phoenix connector allows all signals to be muted in case of emergency except for the console microphone. Power supply can be switched to operate at 110V or 230V. IEC socket with on/off switch. A version of the mixer with external power supply is also available to special order and 19" rack mount wings are available upon request. A focus on versatility and quality from the engineers perspective differentiates this mixer from any other in the market. The Formula Sound and Funktion-One collaboration throughout the design and development of this mixer has led to the FF6.2 being a serious alternative for club installation and events. Its precise creative control and superior audio quality leads directly to enhanced crowd experiences. I guess I have a problem with my Allen & Heath DLive mixer. With 64 inputs I don't have any RCA jacks. I also have to concentrate on my mixes. Looks like you have a real a real inversion issue going on. Is it really this easy to get DJ's excited. 6 inputs. Wow. I just wet myself. Confused as to what "verrona" is. A piece from Vermona? Midas Verona? Something else? I'm sure you wouldn't want others putting a bunch of crap in every other informative post on these forums that you're interested in. Please show some respect. This is the Dimitri from Paris remixes? Thanks for the pointer, been listening to these all afternoon. As for formula sound: one of the best mixes I've ever heard came out of a (full size!) desk made by Formula Sound, and that was a long time ago. Which has a funny twist; I saw Chic in the same venue back in the day, and their sound was mediocre.